Microsoft's Windows Blue update is sure to bring a lot of changes to Windows 8, and chief among those could be a boot to desktop option and the return of the Windows Start menu. Windows Blue (alternately referred to by some as Windows 8.1) could add these major features, Windows staples that Microsoft purposely left out of Windows 8 to make the OS more appealing to mobile and touchscreen users. In its current state, Windows 8 boots directly to the not-Metro interface filled with colorful tiles, but there are plenty of legacy Windows users out there who would appreciate the option to boot directly to the traditional Windows desktop. The old school Start button coming back would be the icing on the Windows cake. It's not a definite yet, but two disparate reports today each attempted to shed some light on whether the Start button and boot to desktop really will be included in Windows 8.1. Can suppress start screen; will suppress start screen? The rumor of an option to boot Windows 8.1 directly to the desktop environment first appeared this week, when forum users digging through the code spotted a line called "CanSuppressStartScreen." That's been interpreted to be a feature that will allow Windows 8.1 users to skip the new-fangled start screen and begin immediately on the desktop. Microsoft hasn't confirmed either way, but The Verge reported today that it had verified with "sources familiar with Microsoft's plans" that Windows 8.1's boot to desktop feature is currently in testing. That's by no means a guarantee that boot to desktop will be included in the final Windows 8.1 release, but with even Microsoft's Windows Product Manager Ian Moulster suddenly emphasizing the speed and security of the Windows 8 desktop, it's seeming like more and more of a possibility. 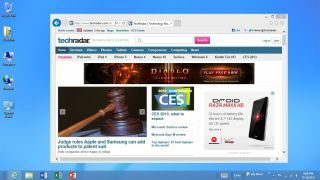 The Verge mentioned in its report that Microsoft is "highly unlikely" to bring the traditional Start menu back, but another report published today by ZDNet told a different story. According to the site's sources, both the boot to desktop feature and the return of the Start button in Windows 8.1 are being considered at Microsoft HQ. At this point "anything can change," the source reported, but at least it's being considered. The collective death knell for the Windows desktop has been sounding as reports that Windows Blue could be another nail in the desktop's coffin have flooded in from many sides. But if these reports of the rise of the Windows 8 desktop and Start button pan out, it seems many may be eating our words. At least in this case, we think they'd be glad to.